The spirit of connectivity is strong in Los Angeles. It is all about collaboration. One event that is leading the changes in music is happening monthly at the SEED Center in the downtown arts district. Led by Alex Park, the event brings a great lineup of speakers, gear demos, and giveaways. They are accumulating a following of approximately 50-80 in attendance of each Jam Night so far. The meetup I went to was on April 2, 2014. 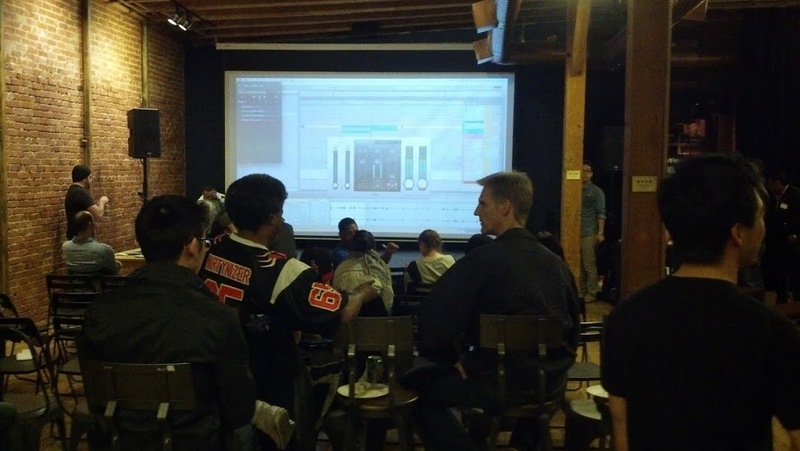 I was invited by Gary Chung from the OC Electronic Music Producers group to check it out. We sat at the back on a white fluffy couch and watched as producers, singer, engineers, and other music enthusiasts filtered in. A guy by the pseudonym Mekanist was the 1st to speak. He played an Ableton track that he is currently working on. It ramps up and echoes off the brick walls bouncing around every surface including the wooden panel floor on the ground. The sounds he uses include coins being rolled and cups being dragged across desks. He also is exploring photography. After a brief transition, Michael Frick and Steph Altman of Mophonics Music got on stage. They sat down and addressed the audience in an informal fashion. Their company hires songwriters and producers to create music for branded initiatives in the ad space. They’ve worked with Apple, Google, Audi, Visa, Muscle Milk and have incubated artists such as Foster the People. Steph keeps people laughing with his humble and honest nature. Michael is more business oriented which manifests a good dynamic between the two. Last but not least to the front of the room is Phil Wagner who is the President of Focusright and Novation. They make the popular Launchpad family of hardware midi controllers that are used by producers, DJ’s, and musicians across the world. Madeon, a 19 year old producer from France, utilized the platform to create an amazing Youtube video showcasing the potential of this platform. Even my roommate in Tallahassee was inspired by the creativity that Madeon presented through the web with the use of the Launchpad hardware. The effects of this movement are witnessed firsthand. As the night came to a close, a majority of the truly passionate individuals stuck around gathering inspiration from the other people around. Contacts and business cards were given out. Connections were linked up. Josh Spoon and Hiko were met. Those two are involved in a Space Circus and are preparing for the upcoming Pasadena Music Festival. Talks of the unique influences of Daedelus briefly surfaces. Even Ilya O shows up to get a feel where the music industry is going. Overall, it looks like these people here will collaborate with one another. It is just unclear yet where exactly it will take us.